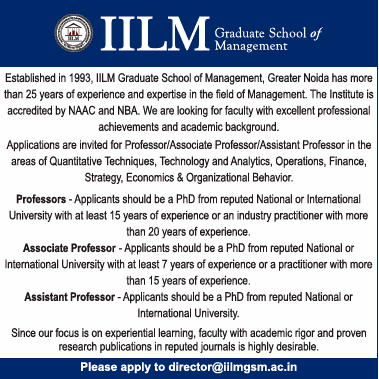 IILM Graduate School of Management, Greater Noida has advertised in THE TIMES OF INDIA newspaper for the recruitment of Teaching Faculty- Professor / Associate Professor / Assistant Professor jobs vacancies. Interested and eligible job aspirants are requested to apply immediately from 06th February 2019. Check out further more details below. About University: The Institute for Integrated Learning in Management – Graduate School of Management is in Greater Noida, India. IILM GSM was established by Ram Krishna & Sons Charitable Trust in 1993 to provide management education. The institute has been ranked as A+ category business school by the AIMA IMRB Business School Survey. Interested and eligible candidates are requested to send application along with CV, copies of certificates and recent passport size photo to the email address given below.